There’s nothing like kicking up your feet, and taking that first sip of ice cold beer after a long day’s work. But do you ever think about the work that goes into making it? Well, the Ontario Brewing Awards certainly do, and they’re back for their 9th year of celebrating the blood, sweat and tears Canada’s brew masters put into each glass of golden goodness. The awards will be announced on site at The Beer Academy in Toronto – come out to find out who won Gold, Silver or People’s Choice! This competition provides an opportunity for commercially-produced beers to be judged against the best beers in the province while giving beer lovers an opportunity to not only meet the brewers behind the brand, but to also sample some award-winning suds. "Hats off to the brewers of Ontario, who continue to raise the bar, producing the highest quality and tasty brews day in and day out," says Les Murray, President of Toronto's Festival of Beer. “It is a pleasure to be associated with such a great industry." North American Light Lager, North American Lager, Pilsner, Amber Lager, Dark Lager, Bock, Honey Maple, German Wheat, Belgian Wheat, Cream Ale, Pale Ale, India Pale Ale, North American Pale Ale, British IPA, North American IPA, Amber Ale, Dark Ale, Porter, Stout, Imperial Stouts, Fruit or Vegetable Flavoured Beer, and Strong Beer. We’ve also added two new awards this year – Newcomer of the Year and Original Brew of the Year. Newcomers this year include Kichesippi Beer Co., Junction Craft Brewing, Kensington Brewing Company, Double Trouble Brewing Co., Spearhead Brewing Company, Sawdust City Brewing Co., and Lake of Bays Brewing Company. Don’t miss your returning favourites! Including; Black Oak Brewing, Cameron’s Brewing Company, Cool Beer Brewing, Creemore Springs, Flying Monkey’s Craft Brewery, Grand River Brewery, Great Lakes BreweryKing Brewery, Lakes of Muskoka Cottage Brewery, Mill Street Brewery, Brewing and Steam Whistle Brewing. 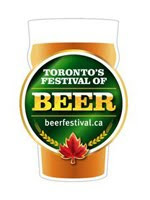 Beerlicious Inc and Roger Mittag, the “Professor of Beer”, will host the awards on Thursday, May 17 from 5-8pm at The Beer Academy, 75 Victoria Street, Toronto. Tickets are being sold to the general public for $10 and include food and beer samples. Tickets are available to purchase through www.beerfestival.ca and www.libationnation.ca.